Rasheed Wallace argues with the referee after being given a technical foul in the first quarter of a game against the Phoenix Suns. Soon after, Wallace was given a second technical and ejected from the game. Last week, prompted by ESPN’s new “30 for 30” documentary on the “Bad Boys” Detroit Pistons, I examined the question of just how “bad” the Bad Boys really were. 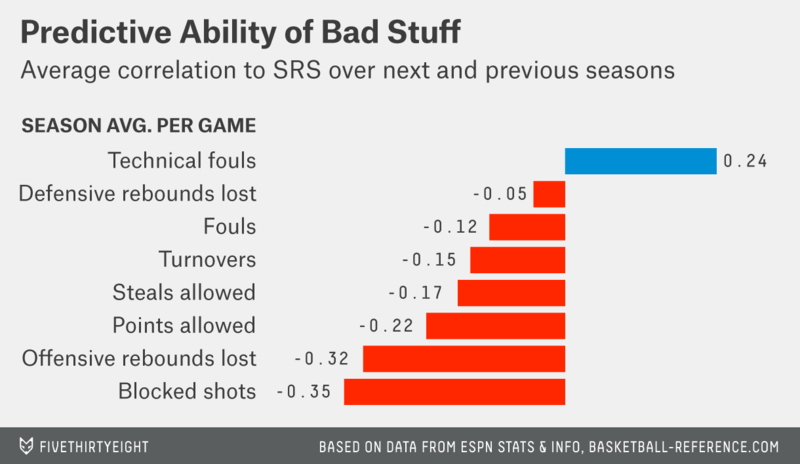 In that piece, I used relative technical foul rates as a proxy for “badness” to establish that the Bad Boys Pistons teams did, indeed, deserve that moniker. Their two championship squads were two of the “baddest” teams in the past few decades, earning more technical fouls relative to their peers than any other teams since 1982. But one question lingers: Were they so good because they were so bad, or in spite of it? 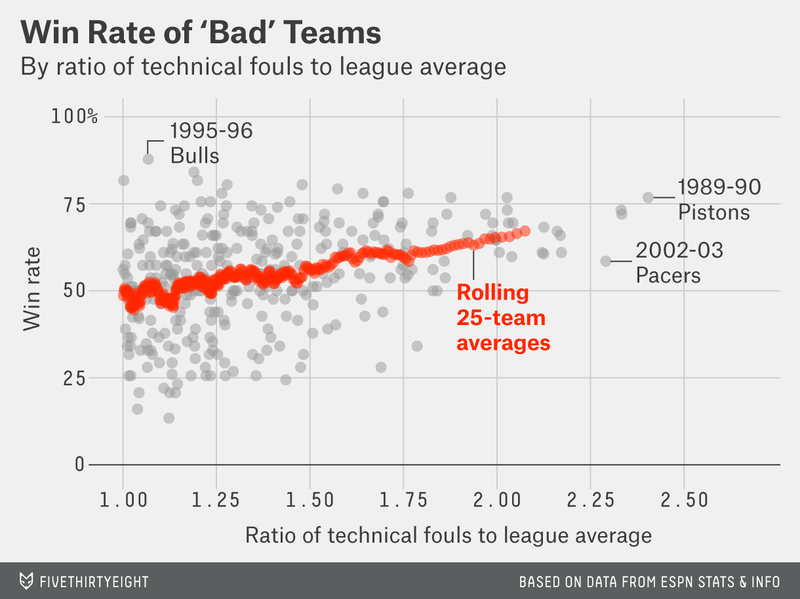 Despite that negative consequence, teams that get more technical fouls than average tend to be pretty good. What’s more, the more technicals they earn, the more likely they are to be even better. Here’s a plot of the number of technical fouls (badness) a team had relative to the league average that year against its win percentage (goodness). The data below is pulled from all team seasons since 1982-83,3 showing only those that were badder than average. Explanations that avoid the nasty conclusion that unsportsmanlike play gives a team an advantage. For example, it could be that technical fouls are committed more often by teams that are already winning, or that winning teams and players just have a propensity to get more technical fouls, and are willing to absorb the cost. In baseball, high/inside pitches used to brush batters off the plate usually result in balls or sometimes even hit batters, but are commonly believed to be worth it (whether they actually are or not, I don’t know). In football, I’ve found that rookie quarterbacks who throw more interceptions (all else being equal) often have more productive careers. In basketball, offensive rebounds have a potentially similar problem from the opposite direction: While apparently a good thing, in quantity they signal that a team doesn’t shoot very well. In poker, a too-high showdown win percentage likely indicates that a player doesn’t bluff enough and/or doesn’t make enough marginal calls. But even if we’re satisfied that technicals can predict wins, there’s still something we haven’t considered yet: Wins may predict technicals.11 This theory has a few possible scenarios associated with it, such as: Teams that are in contention are playing hard all the time — so hard that they occasionally earn a technical — while teams that are out of contention don’t really care enough to do “whatever it takes” to win. That kind of explanation is intuitively appealing, both because the scenario has a plausible ring to it and because it’s the sort of unsexy answer you often find when you try to explain a strange result. I combined all that with in-game win percentage calculations provided by Dean Oliver of ESPN Stats & Info, estimating the foul-committing team’s chances of winning before and after the foul (including the resulting free-throw).13 We’re interested in the difference between what that foul did to a team’s projected results and its actual results. Averaging across all plays, we can represent the results of this comparison in a slope chart that shows how the team’s chances should have changed in that moment, and how often it actually ended up winning. While this result supports our finding that technical fouls predict winning over an even larger number of observations, it’s also consistent with either type of explanation for why this is so. If there were any bias in how technical fouls are distributed — as suggested by the “wins predict technicals” theory — unfortunately it would still bias these results. Lo and behold, they’re extremely similar! Teams tend to win 1.4 percent more often when their players get a tech, and a whopping 5.5 percent more often when their coaches do. That similarity broadly suggests that “bad” (technicals) begets “good” (winning), rather than the other way around. To illustrate: If one great team, let’s call it SuperBad, earned every technical foul every year, but by virtue of being a great team won 5 percent more often than its expected win percentage would suggest, that would show up as a 5 percent gain in the chart on the left. (That’s because each time a team got a technical it won 5 percent more often, even though it was the same team every time, and even if the winning was unrelated.) But when averaged across all 30 teams in the league, it would only show a 0.16 percent gain in the chart on the right (SuperBad team ran 5 percent above average when getting a technical, but the other 29 teams ran 0 percent better15). This would be a perfect “winning begets technicals” scenario. 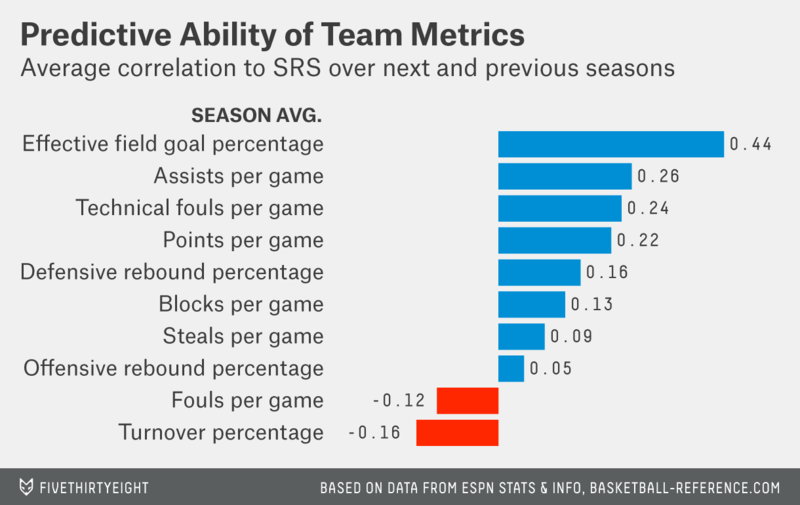 On the other hand, if every team got an equal share of the same number of technicals as our SuperBad team, and every time a team got a technical it won 5 percent more often than it would have otherwise, it would show up both as a 5 percent gain on the left and a 5 percent gain on the right. This would be a perfect “technicals beget winning” scenario. The charts above seem much much closer to this second “technicals beget winning” scenario, as there doesn’t appear to be much difference whether we aggregate by plays or by teams. Indeed, the main reason this isn’t a smoking gun is that the sample size for the right-hand chart is only 120 team seasons, which would normally be much too small to even attempt to draw conclusions about differences of only a couple of percentage points either way. But being so consistent with the much larger sample of the play-by-play chart is powerful corroboration. Coaching technicals appear to be at least as predictive as player technicals. If there’s a correlation between aggressive play and winning and aggressive coaching and winning, Occam’s Razor suggests that you should favor a single theory that explains both phenomena, such as that an aggressive ethos (which applies equally to coaches and their players) causes winning. For what it’s worth, I checked a boatload of possible confounding variables and combinations thereof, such as home/away (53 percent of technicals go to the away team); ahead/behind (57 percent go to the trailing team); and playoffs/regular season (if it were strictly a matter of effort, we would expect a difference when all teams have equal incentives to play hard. No major differences found). Finally, let’s return to the question that kicked off the piece: Were the Bad Boys Pistons so good because they were so bad, or in spite of it? 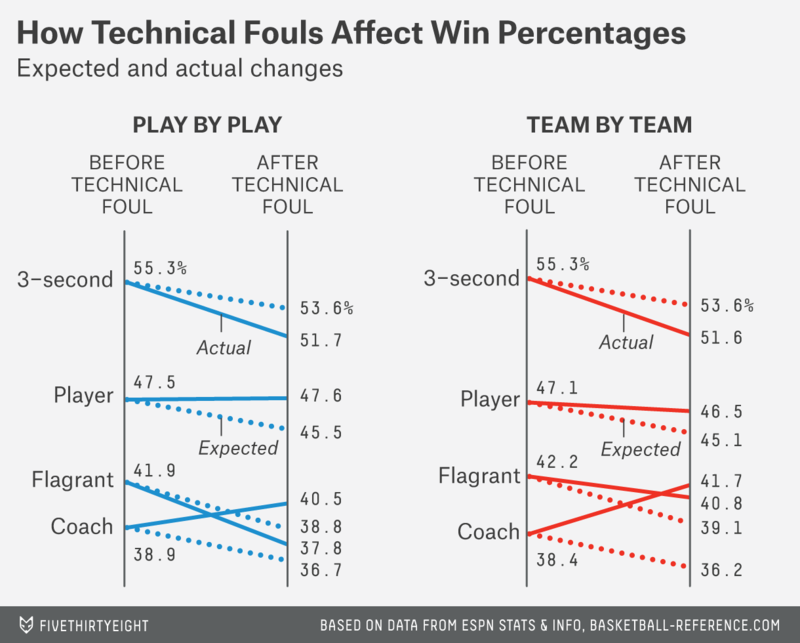 Based on what I’ve looked at so far, I’d say the former has the stronger case: While technical fouls can’t lead directly to winning, the types of behavior that lead to technical fouls just may. In the Bad Boys Era, what are now flagrant fouls were mostly just technical fouls, and didn’t carry the extra penalty they do today. There’s also a minor effect of sometimes adding time to the opponent’s shot clock. Limited to teams for which we have at least 10,000 combined minutes worth of data. The correlation between technical rate and win percentage is .27, which is pretty high for any metric based on only one stat. This is called taking your test “out of sample,” which separates cause and effect. Note, though, that it doesn’t necessarily tell you which is which. The technicals per game metric I used is calculated relative to each season, while the other metrics are not. This gives it a slight advantage. Also, technicals are more positively predictive than turnovers are negatively predictive, which is fascinating but beyond the scope of this article. 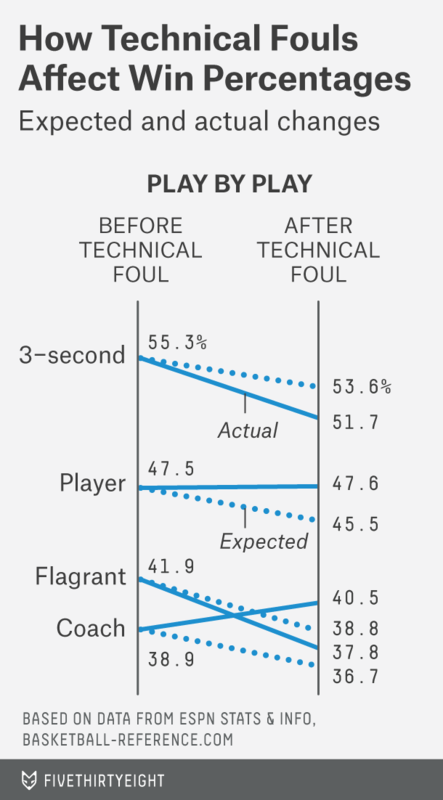 OK, actually there’s a third line of thinking, which is that technical fouls don’t cost the .85 points that we think they do because, say, referees overcompensate for calling technicals by giving teams better calls later in the game. But for all intents and purposes, I’ll treat those as part of the second theory. Compare it to the deterrence problem: In order to coerce different behavior, things have to be punished at a rate much worse than their actual effect. Note the gap between opponent offensive and defensive rebounds is smaller, even though there’s a straightforward reason that offensive rebounds are a mixed blessing (because it means the team is missing more shots). It’s like the Euthyphro question, but for sports gods: Are technicals good because the sports gods love them, or do the sports gods love technicals because they’re good? For the data set I used below, I also applied a number of filters: I filtered out the fourth quarter because variance is too great and tactical considerations trump other things. I also dropped hanging, taunting, non-unsportsmanlike and team technical fouls because their numbers are too small to break out, and I’d like to keep the main-line group as homogenous as possible. I also duplicated all of this research using margin of victory so as not to rely entirely on the predictive algorithm, and the results were virtually identical. Flagrant fouls don’t do as well, though they include a harsher penalty, including the possibility of the player being ejected. OK, technically undefined in this example, so add epsilon if you must.